First instituted as Louisiana Polytechnic Institute in 1894, it's perhaps best known now for its engineering programs and women's athletics. But its greatest and most notable claim to fame was a 6' 3" 215 pound "Bull Dog" named Terry Paxton Bradshaw. Though he never made a Louisiana High School Athletic Association All-State team, the blond-headed kid had college gridiron coaches salivating when they saw him unleash receiver-seeking missiles. 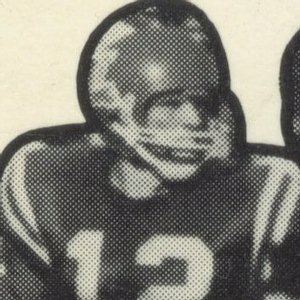 "The Blond Bomber" aptly named at Louisiana Tech, lead the Bull Dogs to consecutive bowl appearances in his junior and senior years. This achievement and his howitzer for an arm made him the first pick in the 1970 NFL draft. Before Bradshaw's NFL switch to the Rawlings line of head protectors, he wore the Riddell TK2 suspension helmet. The face mask of choice through his college and early days with the Steelers was the Dungard DG105 two bar. This light weight face mask sat high on the helmet and added much more protection to the nose area. Starting around 1968 this unaltered Louisiana Tech decal shown above, could be one of the longest running logos in college history. 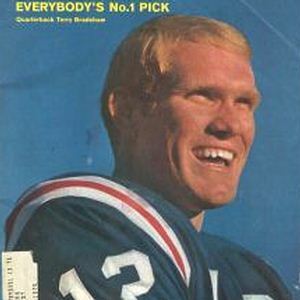 "Wherever I have traveled, through all parts of the country and world, I will invariably have somebody connect the name of Terry Bradshaw with Louisiana Tech," said University President Dan Reneau. "Terry was not only a great football player for the university, but remains as a tremendous ambassador." To which the good ol' Southern-raised Bradshaw might answer with an "aw shucks."